GE dishwasher displaying an error code? Newer style GE dishwashers have built in diagnostic systems. If your dishwasher detects a fault or error in the system, it will show an error or fault code. The error code will display where the usual numbers are on the display screen. When an error code is displayed, your dishwasher is telling you a specific fault. 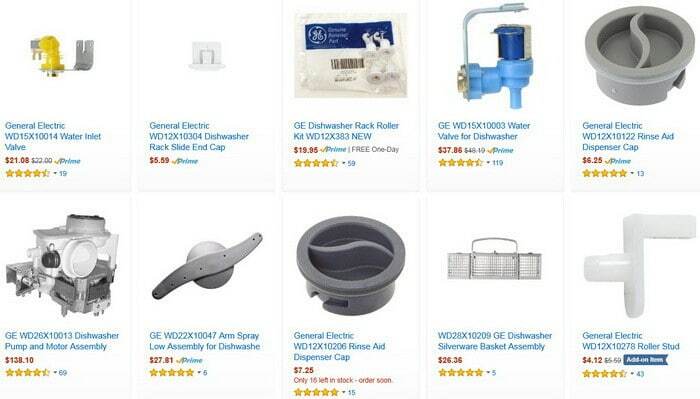 You can also search YouTube for GE dishwasher fix, or get advice from GE for troubleshooting your GE dishwasher when your GE dishwasher is showing an error code or not working properly. 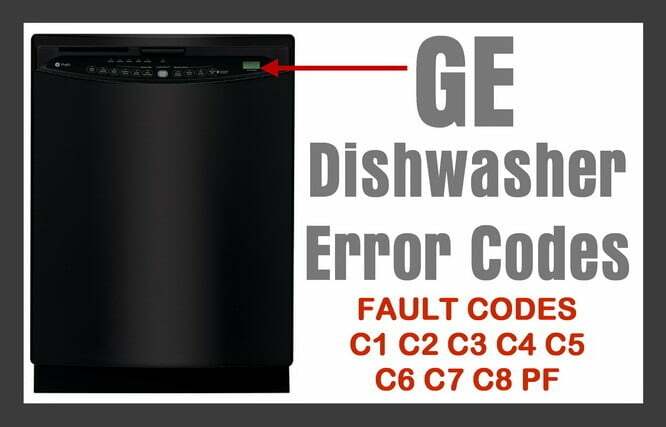 See below for the error codes your GE dishwasher may show and how to clear them. Repair or Check = Power fail to the dishwasher. Power to your home may have gone out. Restart the dishwasher and try a wash cycle. Repair or Check = Remove any clogs from the sinks drain. Remove power to the dishwasher. Remove clogs from the dishwasher’s draining hose. Be sure the draining hose is not damaged and if so replace it with new. Examine the drain pump for any blockage. Clear any blockage if found. If you find the drain pump to be damaged then replace it with new. Repair or Check = Remove any clogs from the sinks drain. Remove power to the dishwasher. Remove clogs from the dishwasher’s draining hose. Be sure the draining hose is not damaged and if so replace it with new. Examine the drain pump for any blockage. Clear any blockage if found. If you find the drain pump to be damaged then replace it with new. Press RESET to stop the beep. Repair or Check = Cancel the wash cycle. If the dishwasher will not drain after cancelling… Troubleshoot using the C3 error code above. If the dishwasher does drain after cancelling the wash cycle then check for somethign lodged underneath the overfill float. If nothing is lodged under the overfill float then remove power to the dishwasher and examine the overfill float switch for proper operation. If the overfill float switch is damaged then replace it with new. Repair or Check = Be sure the water supply valve to the dishwasher is completely open. Be sure the overfill float switch is not stuck in the up position as this will prevent the dishwasher from filling with water. Remove the dishwasher from power and turn off the water supply valve. Remove the water fill line and check the water inlet valve. If the inlet screen is blocked or has clogs then replace the water inlet valve as only cleaning the screens is not enough and can cause flooding. Check the wiring harness on the water inlet valve to be sure there are no loose wires. If you find that the water inlet valve does not open when power is applied then replace it. Repair or Check = Turn the hot water on for the sink and run for 2 minutes. If the temperature of the water is under 120F then you may need to adjust the water heater thermostst. 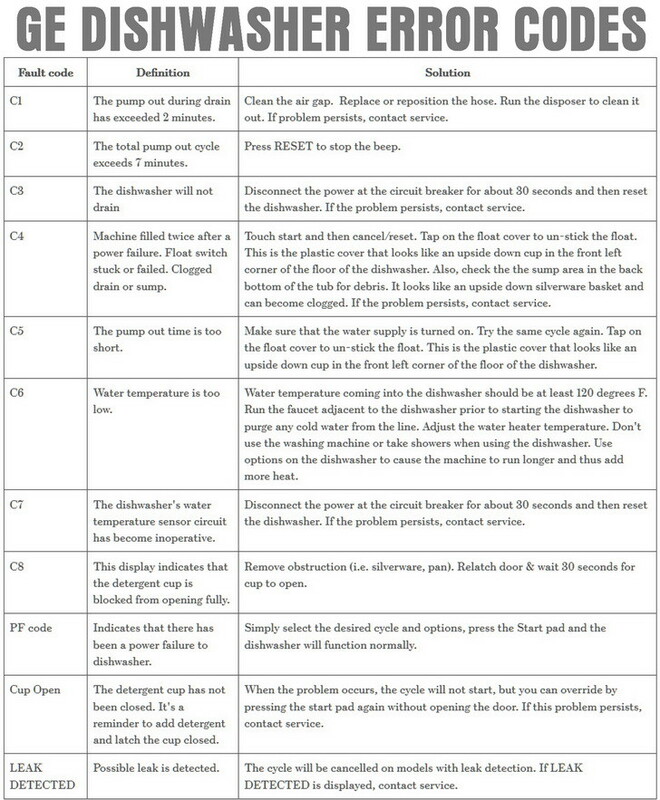 If the water supply to the dishwasher is over 120F then the temp sensor or electronic control board may be defective. Repair or Check = Remove power to the dishwasher for 5 minutes. Removing power is to try and reset the electronic control board. Plug the dishwasher back into power and see if the error code C7 reappears. If so, remove power to the dishwasher and check for any loose wire connections on the water temp sensor. If the wiring harness is secure then replace the water temp sensor. If the error comes back then replace the electronic control board. Repair or Check = Remove what is blocking the dispenser cover. Shut the dispenser cover and restart a wash cycle on the dishwasher. After 20-30 seconds into the wash cycle check to see if the cover opened. If the detergent dispenser cover will not open as it should or the detergent dispenser itself is broken or has damage then remove and replace it. NOTE: Disconnecting power to the dishwasher for 30 seconds may clear the fault, error or function code. Unplug your dishwasher for 30 seconds to 5 minutes to try and reset the control board. This may clear the error and reset the dishwasher. Do you have additional GE dishwasher error codes we have not mentioned? Are you having additional trouble with your GE dishwasher? Please leave a question or comment below and we can further assist you with troubleshooting your dishwasher problem. OR, please contact GE Consumer Service at 1-800-432-2737. GE Dishwasher GDT580SGF6BB – started last night and it ran for a while and then went dark – I checked the circuit breaker but it was ok. I pressed the start and select buttons and get an error code 888. There was water in the underneath pan which I believe is caused by the water line dripping. I dried out the pan but no luck restarting the machine. Any ideas what could be causing the problem and how to fix it? the service mode runs through 12 steps. When I run the test it stops at step 9: turn on main pump + heater. if you press the start/cancel button to move to the next step the dishwasher continues the test 10: turn on drain pump and continues on to set 12 to end the test cycle and you get the F0 code. I cannot find this error code anywhere on the web. I know its not the PC board because I replaced it and the problem persists. Then I changed the thermistor … no luck there either. please help! I have a GE dishwasher model 2800. Every few minutes during the cycle it stops and a “blocked arm” signal flashes. The arm is not blocked. If I move the off/on handle to the left(off) position, then back to the right(on), the cycle picks up where it left off. It runs a few minutes more, then stops again, flashing the blocked arm signal. The cycle finally completes, but I have made multiple trips to the dishwasher during the process. My power went out yesterday. We have reset breaker several times and held down start and select cycle. When you press another button, screen goes blank or eventually shuts off on own. GE Dishwasher GDF630SGK0BB is flashing code E4. Looked online and said Water Switch Fault. It’s brand new and this is the first time using it and yes I tried turning off power for a few minutes and when I turn back on still flashing the code E4. Power went out yesterday and no power is going to dishwasher. We have reset breaker and held down start and select cycle. Not have active error code: none. Dishwasher stillness won’t do anything. When you press another button, screen goes blank. IT JUST STOPPED WORKING AND I cannot find anything online or in the manual. How did you end up fixing the E8 error? Please supply us with the Model Number of your GE Dishwasher. “OE”	Drain error > Condition: The drain hose kinked or blocked. Wiring connections. The drain outlet of sump is blocked. The drain pump/motor or circuit is troubled. Remove kink. Check wiring. Measure the resistance of drain motor (20-40ohms) Replace the drain motor or repair the circuit. Every time I run my dishwasher, it runs and stops and gives me the PF (power failure) code. I have never had a power failure in my house when the PF code shows up. I checked the GFCI plug but the garbage disposal that is also plugged into it works and the dishwasher powers on and never seems to lose power. I checked the fuse box in the garage and the fuse is fine. I checked the other end of the power cord under the dishwasher and all of the wire nuts are on tight and the wires are good. I select a cycle the minutes will display in the cycle time window. A few seconds pass then “1H” displays in the window…..I can’t find out what this means. I’m Having what appears to be two problems, I don’t think the dishwasher is filling with enough water and the heating element doesn’t seem to be working. I replaced the heating element only to find out the old one was still good by checking the continuity. I replaced the water fill valve and it fills for @ 70 seconds but I’m at the same water level as the old fill valve. The water fills to the very bottom of the flood switch, about a half inch or so below the heating coil, I don’t know how high its suppose to fill, I’m thinking deep enough to cover the heating coil and maybe activate the flood switch to turn the water off and stop the fill cycle. I checked the flood switch for continuity and it seems to be working, however in the past 2 months we noticed a little bit of water on the floor and I thought we may need a new flood switch but it stopped happening so I temporarily ruled it out, the water isn’t filling deep enough to activate it or cause a flood. I have a GE Profile PDW7880G00SS, it’s about 14 years old. It still cleans the dishes, I turned my water temp up a little at the hot water tank too make sure plenty of hot water goes into the dishwasher. so my question is, what should I do, maybe replace the control module and flood switch? I went into the built in service mode for the dishwasher with the bowed panel and 3L is suppose to activate the heating element, it doesn’t but the pump seems to start, that’s what the flat panel is suppose to do. I tried 4L to activate the heating element even though its suppose to be for the flat panel and I have the bowed panel as I said before, the heating element still doesn’t come on. I noticed one of the wires for the heating element goes to the control module, so I’m thinking the control module isn’t working properly and replacing it may solve the heating problem and possibly the not enough water problem if there is one. If you can answer any of these problems at least tell me how deep the water should be after filling for the wash cycle as I would very much appreciate any help you can give me. Like I said before, the dishwasher is still doing a good job of cleaning the dishes, but we use the sani cycle a lot and also the heated dry cycle. Thank you. Yes replacing the control module and POSSIBLY the flood switch should remedy you issue. If the heating element checks good, then the control module could be causing the element to not heat. Let us know what you find. I get an E3 error code on my GE dishwasher. I can’t seem to find any answer to what that is? Would anybody here know by chance? Thank you very much in advance. Are you sure it is not the error code C3? This would indicate a draining issue. You have a GE dishwasher, correct? Either way, try disconnecting power to the dishwasher for 5 minutes and see if that MAY clear the error code. If not let us know and we can research further. A Technician came and said it was some sensors. He said he exchanged them but the dishwasher is still not working. He charged me a lot and I doubt he replaced anything. The machine runs the whole cycle but when it stops it says error code E3 and the dishes are not clean and they’re also partially wet. Could it be the sensors and how much would it cost to buy those? The model of the dishwasher is a GE profile, PLV1870XSS. Thank you so much for your fast nice answer. Yes possibly a sensor is causing your issue. Can you give us the full model number once again as the GE PROFILE PLV1870XSS does not come up correctly in our database. This is a discontinued model by GE as it was as some say, problematic. Hi again and thank you so much for your help. Next post: Refrigerator Display Panel Is Blank Not Working – How To Reset?